Recent innovations in technology and the internet have seen us increasingly consuming more media on the move. 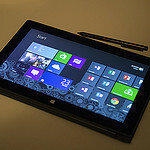 The Microsoft Surface is kicking up a storm as the new laptop-meets-tablet hybrid on the tech and entertainment market. Boasting the key perks of each device; with the light weight of a tablet and the processor of a laptop, can the Microsoft Surface really do it all? Featuring a 12 inch screen, a fourth generation Intel Core processor and up to nine hours of battery life, the Microsoft Surface certainly packs a punch in the world of technology. Home to three ports and an optional keyboard, it takes the lead where earlier tablets have failed. Unlike standard tablets, the Microsoft Surface allows for greater security with the regular 4 PIN passcode strengthened by a personalised picture password, meaning you don’t need to worry about sensitive information or even your kids picking up the device and having a go. Once you’ve downloaded your preferred apps, you can then re arrange and even re name these on your home screen for quick and easy accessibility. You can also link your tablet up to multiple email accounts, social media feeds, networking and business messengers, allowing you to access both your work and personal emails on the go from one device. Setting up your new Surface with Microsoft security software means that if your tablet is lost or stolen, your data will be encrypted and away from prying eyes. If you’re using the tablet for anything other than writing quick emails then consider purchasing a detachable keyboard as it will make your time much more productive. As with all modern, powerful technology, battery life is the bane of your tablets performance capabilities. Never get caught short again by purchasing an external battery pack, these light and compact chargers will come to the rescue at your time of need! Although the Surface comes with a higher price tag than your standard tablet, it’s easy to see why. Microsoft has strived to create a tablet-laptop hybrid which shows off the ‘Windows experience’, allowing the user to access everything they need from one portable device. If you’re looking at purchasing the Surface do some research, as the newer model may better suit your requirements.